Enjoying essential oils to the fullest doesn't have to mean carrying a bulky vaporizer wherever you go. The iMini Kit by Plutotech with Ceramic Tip and Airflow Control is one of the smallest, lightest oil vapes on the market and is intuitively designed to give you an incredible vape experience. With this starter kit, you'll receive the Pluto iMini vape, the Pluto wickless 510 thread tank and a USB charger, everything that you need to vape. Measuring 48 millimeters by 30 millimeters by 16 millimeters in size, the truly unique Pluto iMini vape fits in your hand with ease and is difficult to spot during vape sessions. The discrete vape can stow away in your pocket or bag without worry about leaks. Although it's small in size, the oil vaporizer provides powerful performance with a 15-watt direct output and a 500 mAh integrated battery. To ensure durability on the go, the vape is wrapped with impact-absorbing, rubberized material. The Pluto iMini vape comes with an innovative floating tank design. This crystal-clear chamber is completely exposed on the side of the vape, so you can easily monitor how much material remains inside. Made out of breakage-resistant glass, the tank maintains vapor purity and is able to withstand bumps. You don't have to worry about the Pluto iMini vape operating accidentally when you're on the go. The vaporizer has a 5-click safety lock that disables the battery while you travel. A blue LED light located under the firing button tells you when the device is locked. When you want to vape on demand, you can use the handy preheat function of the Pluto iMini vape. Just tap the button once after unlocking the battery to get the vaporizer heated up. This way, vapor flow will begin as soon as you push the firing button again. The Plutotech wickless 510 thread tank is engineered for optimal performance. With no wick of any kind, the tank provides a steady flow of vapor and is easy to maintain. The top airflow can be adjusted to increase or decrease draw tension to suit your needs. The 510 threading allows you to replace with any other 510 tank if you wish, up to 12 millimeters in diameter. Which makes the iMini Pluto universal and compatible with most of the industry standard tank cartridges on the market. 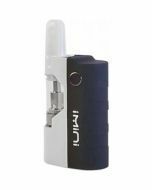 Savor the flavor of your favorite essential oil concentrates discreetly wherever you go with the iMini Kit by Pluto with Ceramic Tip and Airflow Control. Add one to your cart today.